PRINCETON, NJ -- Texas continues to be the state with the highest percentage of residents without health insurance. At 27.6%, its rate is more than four percentage points higher than the next highest state, Mississippi. This is the largest gap Gallup has measured between the first and second state since it began tracking health insurance in 2008. Massachusetts remains the state with the lowest percentage of uninsured, at 4.9%. Vermont, Hawaii, Connecticut, Minnesota, and Wisconsin also have uninsured rates below 10%. The four-point gap between Texas and Mississippi in 2011 exceeds gaps of less than three points between Texas and Mississippi in 2010 (27.7% vs. 24.8%) and 2008 (25.0% vs. 22.2%) and between Texas and Louisiana (27.0% vs. 23.5%) in 2009. Nationwide, 17.1% of Americans lacked health insurance in 2011. These results are based on the Gallup-Healthways Well-Being Index for 2011, and are based on interviews with more than 350,000 U.S. residents throughout the year, which includes at least 1,000 residents in every state. In general, the states with the lowest percentages of uninsured residents are concentrated in the east and upper Midwest, with Hawaii the lone exception. States with the highest proportions of residents lacking health insurance are in the southern and western parts of the country. 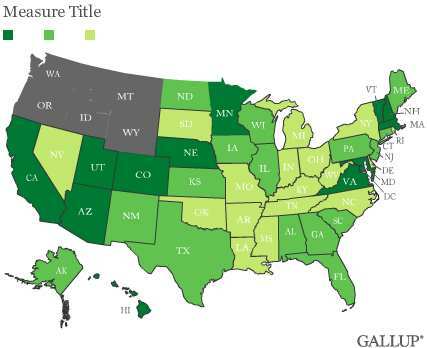 Massachusetts has ranked first and Texas last in each of the four years Gallup has measured health insurance coverage at the state level. Massachusetts' low rates are probably due to the health insurance reforms passed in that state in 2006 under then Governor Mitt Romney. The reasons for Texas' consistently high uninsured rates are less clear, although its large Hispanic population is likely one factor, as Gallup finds especially high rates of uninsured among U.S. Hispanics. More broadly, the states with the lowest uninsured rates in 2011 have also been among the lowest every year since 2008. Six states -- Massachusetts, Vermont, Hawaii, Connecticut, Minnesota, and Pennsylvania -- have ranked in the top 10 lowest states each of the last four years, with Wisconsin and Maryland doing so three of the last four years. Four states have ranked among the 10 with the highest percentage of uninsured residents every year since 2008, including Texas, Mississippi, Oklahoma, and Nevada. Florida, California, Arkansas, Georgia, New Mexico, and Louisiana have done so three of the last four years, with Louisiana finishing just outside the top 10 this year. One sign of a declining rate in the uninsured, though, would be a consistent, year-to-year decrease in the percentage of uninsured. No states have shown such a pattern since 2008, making it unclear if any state has made real progress in reducing the percentage of their residents lacking health insurance over the last four years. That may not be surprising given that, nationally, Gallup has found year-to-year increases in the percentage of uninsured at the national level, with an increase from 14.8% to 17.1% over the last four years. Five states -- Rhode Island, Florida, California, New Jersey, and New York -- have shown measurable increases each year in the percentage of residents who are uninsured, suggesting that these states are showing a real increase in number of people who do not have health insurance. Massachusetts has also shown increases in uninsured rates each of the last four years, but these have been minimal each year and the total increase there since 2008 is less than a percentage point (from 4.2% to 4.9%). Four years ago, Rhode Island and New Jersey were among the 10 states with the lowest percentage uninsured. But because of increases in the percentage of uninsured in these two states in recent years, they no longer hold that distinction, though their percentages of uninsured remain low compared with most other states. Meanwhile, California and Florida have moved up among the states with the highest percentage of uninsured after being outside the top 10 in 2008. Massachusetts and Texas continue to set the lower and higher ranges of uninsured residents by state. The relative rank order of the states has generally remained consistent from year to year, underscoring the general stability of these rates over time. Further, no states have shown a measurable decrease in the percentage of residents uninsured since 2008. Nationally, more Americans have reported being uninsured each year since 2008, and a few states have followed that pattern. One of the primary goals, if not the main goals, of the 2010 healthcare overhaul President Obama and the Democrats in Congress passed was to reduce the percentage of uninsured Americans nationwide. The law is still trying to survive legal challenges, which the U.S. Supreme Court is hearing later this month. If it survives all the legal challenges, the healthcare law will be mostly implemented by 2014, and its ultimate success in achieving its goals will be apparent in the percentage of uninsured Americans from that point forward. 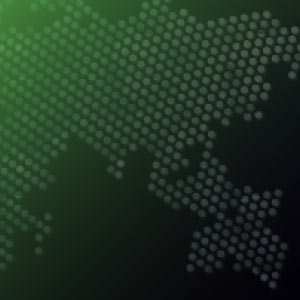 Gallup's "State of the States" series reveals state-by-state differences on political, economic, and well-being measures Gallup tracks each day. New stories based on full-year 2011 data will be released throughout the month of February. Margins of error for individual states are no greater than ±4 percentage points and are ±3 percentage points in most states. Voters have both more positive and more negative reactions to Obama's association with the national healthcare law than to Mitt Romney's association with the Massachusetts healthcare law passed when he was governor.